A few years back our pastor decided that he would like to make some changes in our curriculum so that everyone from the babies in the nursery to the senior adults would be on the same page each Sunday. I wasn't sure at first if I would like it but after a few weeks I couldn't imagine it being any other way. In order to accomplish his goal we began using the same passages of Scripture for all Sunday School classes and the Sunday morning message. Of course the adult classes were much more detailed than the nursery lessons but we all studied the same portion each week. 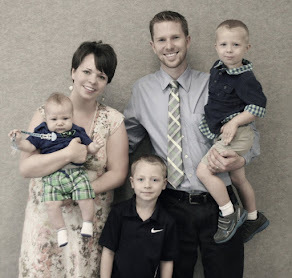 Not only was this a nice thing for our church family, it was also very beneficial for our personal family. Have you every been on the ride home after church and asked your little ones what they were learning in Sunday School only to have them say "I don't know."? It has happened in our family more than I would like to admit. Now with the changes it is easy to give little prompts to jog their memory that can then lead to a full-blown conversation. This is especially beneficial for Granny and Poppy. We automatically feel connected because we know what their lesson was about. Sunday lunch conversations have taken on a whole new dimension and I for one love it! In fact we enjoyed studying the same Scripture together at church so much that we decided to try something special in our homes during the Christmas season. We chose to Celebrate Advent with the Jesus Storybook Bible by Sally Lloyd-Jones. The two houses that had children used the Jesus Storybook Bible and the two houses that were adult only used The Story of God's Love For You. 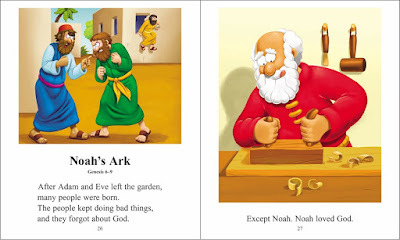 The two books contain the same words but the illustrations are different (one being for children and the other for adults). You can read more about the specifics of how we did it HERE. That was such a wonderful experience for our extended family that we began talking about practical ways we could incorporate this same concept into our daily devotional routines. At first the task of putting together something that would not only be meaningful to the adults but also work with the different ages and stages of our kiddos was a bit daunting. As much as we liked the idea not one of us had the time or motivation to take on the work of putting together the daily devotions. Just when I was about to give up on the notion a brilliant moment of inspiration struck. I was sitting in the rocking chair with my four-year-old grandson and we were reading our new copy of the updated The Beginner's Bible. If you are familiar with this storybook Bible you know that it is intended for toddlers to preschoolers and walks them through the highlights of the Old and New Testaments with simplified storylines. 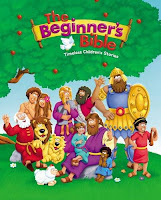 As we were reading through a few of the stories it occurred to me that we not only had the toddler/preschool version of The Beginner's Bible we also had the New International Reader's Version (NIrV) designed for younger readers and the King James Version (KJV) designed for adult readers of The Beginner's Bible. After talking it over with my daughter this is the plan that we came up with. We're going to use The Beginner's Bible (preschool edition) as our guide. Each story gives the Scripture reference and that will be what we use for our older kids and adult readings. So for example the very first story is called The Beginning and it is on Genesis 1. 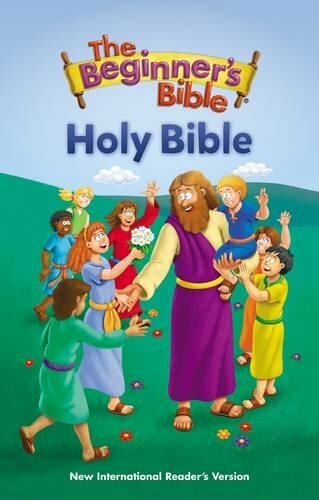 That story will be read aloud to the preschool and under set sometime during the morning at the usual Bible time. Then the kids that can read will read Genesis 1 aloud from The Beginner's Bible, NIrV edition during their Bible time. (We homeschool so there is a set time each day for these activities.) 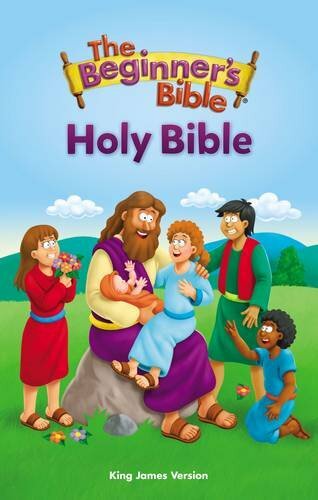 Then in the evening Daddy will read Genesis 1 out of The Beginner's Bible, KJV edition. Granny and Poppy will also read that same passage at their house. I have to tell you that I am absolutely loving this new routine. Poppy and I like to read our portion in the early morning so that we can interact with the grands during the day. I know about when their Bible times are so I enjoy either calling the little ones or sending a text to the older ones about some portion of the Scripture that stood out to me. 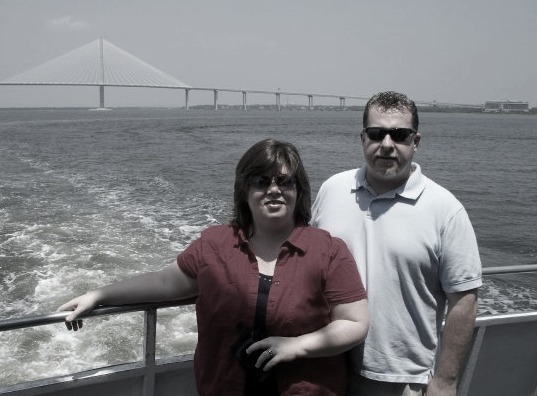 For me it is a special way to be connected to the grands while at the same time backing up and supporting the parents. Now . . . how about a GIVEAWAY?!! 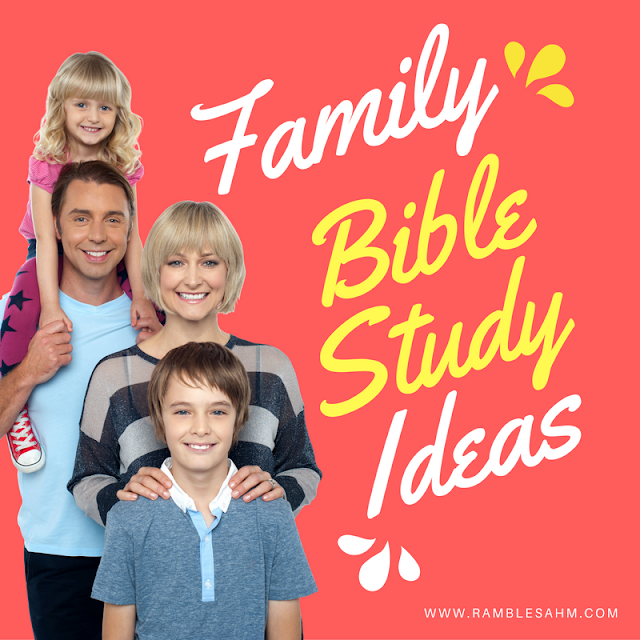 Would you like to give Family Bible Study a try like we are? We've partnered with Zonderkidz to make a way for one of our readers to get their own copies of The Beginner's Bible (preschool edition), The Beginner's Bible, NIrV edition, and The Beginner's Bible, KJV edition. 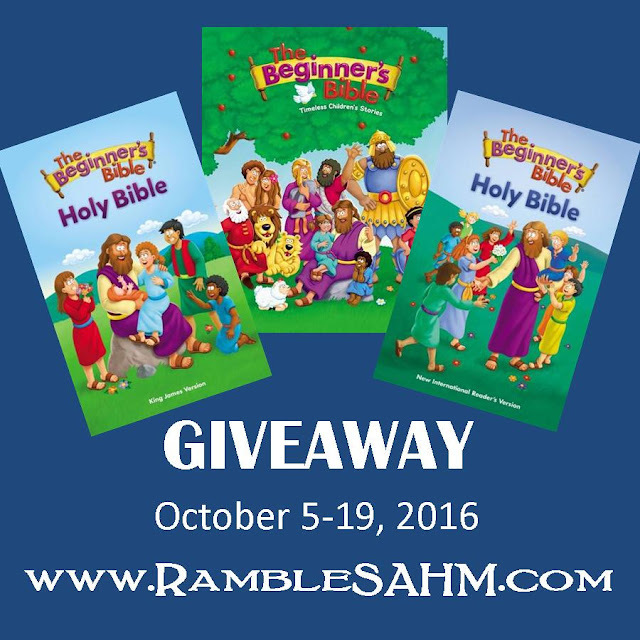 The giveaway is open to U.S. residents and will run through midnight on Wednesday, October 19, 2016. You must be at least 18 years old to enter. The winner will be contacted by email and will have forty-eight hours to claim the prize. If unclaimed, a new winner will be drawn. The winners’ entries will be verified. Please enter the contest using the Giveaway Tools form below. All entries are optional. We start it right before I prepare supper. We are all together. Be consistent with a time, and keep it short (5-10 minutes) when the kids are little. When everyone is home together.